This is the USA Collection edition of the Cyborg. Cyborg is a collaboration model with Japanese maker, Turning Point, and is the signature model for Patrick Borgerding. 2012 US Champion, Patrick Borgerding gets his own signature model, the aptly named Cyborg. Japanese maker Turning Point&apos;s owner, Kentaro Kimura enthusiastically collaborated with YoYoFactory to design this yo-yo. 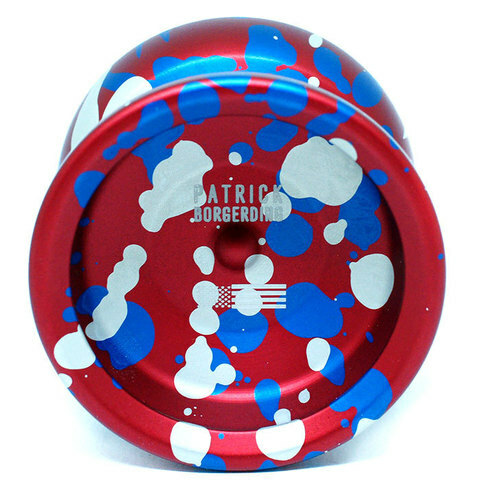 This is the second collaboration model between YoYoFactory and Turning Point. The Cyborg takes its cues from the Proton, the previous collaboration model between the two makers. The Cyborg is slightly larger, with both the diameter and width a full millimeter larger than the Proton. With no change in body weight, the result is an overall feeling of power. With the full weight and passion of two of the best American and Japanese competition yo-yo makers behind it, the Cyborg is set to take the world by storm, don&apos;t miss it! The USA Collection has special anodization that pays tribute to the star spangled banner sporting a beautiful red, white and blue splash coloring. Even the included (100% polyester) string is red, white and blue.